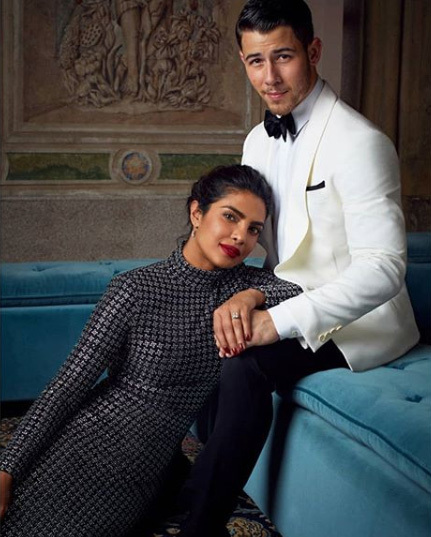 Priyanka Chopra and Nick Jonas Are Married In First Of Two Wedding Ceremonies This Weekend. First the Christian wedding ceremony and then the Hindu ceremony this weekend. The couple tied the knot during a Western wedding in Chopra’s home country of India on Saturday, PEOPLE confirms exclusively. The nuptials, held at the Umaid Bhawan Palace in Jodhpur, Rajasthan, come just four months after the pair was engaged in July 2018. Chopra, 36, was a glowing bride in a custom Ralph Lauren wedding gown, and Jonas, too, wore Ralph Lauren. In fact, so did both families, all of the bridesmaids, and all of the groomsmen (which included Chopra’s brother Siddharth and Jonas’ three brothers, Joe, Kevin, and Frankie). Of course, Lauren is an important designer to the couple not only because he is a close friend of the actress but also because she and Jonas, 26, both rocked Ralph Lauren Collection at the 2017 Met Gala, which took place one week after their unofficial first date. The groom’s father, Paul Kevin Jonas Sr., officiated Saturday’s Christian ceremony, where the couple exchanged wedding bands by famed jeweler Chopard. On Sunday, the bride and groom will continue their epic wedding weekend with a Hindu ceremony to honor Chopra’s background. Ahead of their big weekend, the couple celebrated Thanksgiving in India together. Days later, they held a puja ceremony to spiritually celebrate the upcoming event. Following their arrival in Jodhpur, Chopra had a mehndi ceremony, where all the women in the bride and groom’s families and close female friends gather as the bride has elaborate henna designs applied to her hands and feet (guests usually get a few designs on their hands too) and the couple celebrated with a sangeet, an over-the-top party with endless food and drinks and perform songs or dances in honor of the couple.